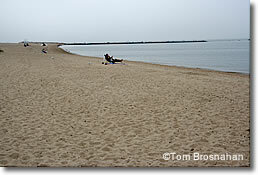 Protected by Long Island from the open sea, this long sand beach has gentle waves, warmish water, and camping right next door. 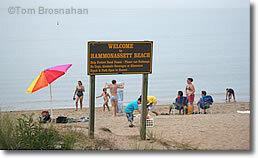 Connecticut's Hammonasset Beach State Park (map) is the Connecticut shoreline's longest and grandest beach, stretching for more than two miles (3.2 km) along the warm waters of Long Island Sound. Full facilities include showers, changing rooms, toilets, food stands, picnic tables, nature trails, a car-top boat-launch ramp and even a campground (warm months only).